What would George Herbert Walker Bush advise us about being a patriotic American? Read more in this week’s CLP Current Event. “As people attempt in the coming days to define President Bush, they will characterize him as wise, gracious and committed to civility. And they will speak of his courage, from his days as a fighter pilot to his birthday celebrations jumping out of airplanes. 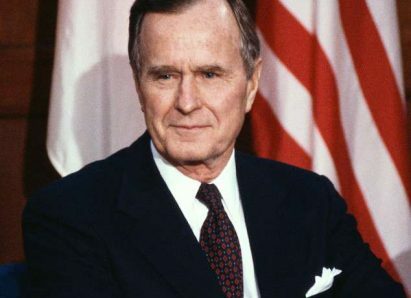 Who was President George Herbert Walker Bush? What is his political legacy? How did family influenced his career? What might explain his passion for public service? What was the Points of Light initiative? What was the impact of military service for George HW Bush?W Bush? Did he symbolize the end of World War II’s Greatest Generation? How important are “people skills” for an effective president? Was his time in Congress related to his decision to ask Congress for permission to begin the Persian Gulf War? Was George H.W. Bush the “foreign policy” president? Why or why not? Did George HW Bush demonstrate the President that the Framers envisioned? If so, what were those qualities? If not, what was lacking?